Single-pedal flush. Elegant; easy to install. 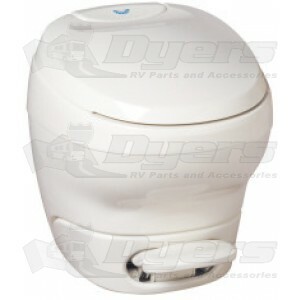 Elegant Design in Lightweight, All-plastic RV Toilet. Large and convenient single-pedal flush. Universal floor flange, mount on any flange. Attractive styling that's easy to clean. Pulsating flush provides superior, near instantaneous full-bowl washdown. Front shroud pulls off for easy access to mounting bolts and pedal mechanism. Taller for a built-in higher comfort level. Easy-off seat and cover Pod for easy cleaning or service.